Hope you all had a nice relaxing long weekend. Ours was pretty uneventful around these parts, which is totally okay with me. We went to the park, lunched, had friends over and documented none of it. 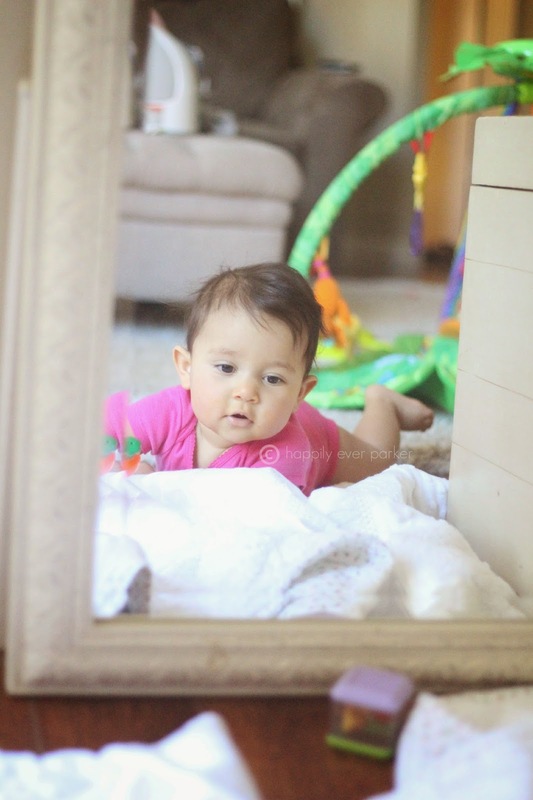 P has really taken a liking to her reflection and its been fun to see how excited she is to see herself. She has also mastered bye bye and is waving non-stop. I did manage to get down to the Nordstrom half yearly sale this weekend where of course what I bought was not on sale. But I am in love with these slip on converse, it's the first time in a long time I have had closed toed shoes and I am loving it! My friend also picked me up the Rifle Paper Co. + LeSportSac makeup bag and ya know what....not that impressed! It was cute, but it was pretty small and at more than $35 it went right back to the store. This tote however may be more worth the hype. You probably noticed that we got a little makeover here at Happily Ever Parker. I wanted simple and clean and I hope that is what you find over here! Love the new blog look :) That's such a great photo of Presley!! What sparked the new blog change? I thought I noticed a change...love the new design! Gorgeous - the site and that girl! The new design looks so pretty Laura!